THE £4 million Coign Church and Bouygues proposals could get the go-ahead when they imminently become the focus of a discussion at Woking’s Civic Offices, though not without a battle, say the 123 petitioners who were last week informed of the agenda for the planning meeting. The Coign’s applications for a development on the outskirts of Woking town centre have been back and forth to the drawing board since 2006, when the church proposed a 13-storey block of 161 flats, which was rejected outright. Earlier last year, the Coign Church and Bouygues Development Ltd toyed with even more ambitious plans – for two tower blocks comprising 170 apartments with a 1,000-seat church auditorium in the basement of one block. Residents and local councillors breathed a huge sigh of relief when the controversial proposals were withdrawn before an application was formally submitted to the council. The residents of Vale Farm Road and Oaks Road have maintained all along that they have no objections to a bigger church being built and the area being redeveloped as they agree that both are badly needed. However, among parking and infrastructure issues, a main concern is that the designs have not complied, and still don’t, with the council’s Core Strategy. 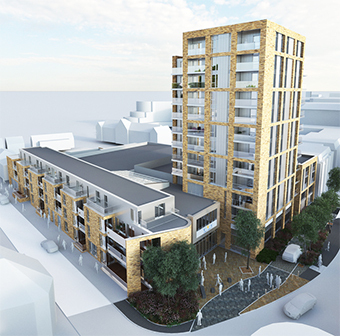 Residents complained that the latest revised proposals revealed in June – for a single 12-storey tower and two smaller three to four-storey buildings housing 85 apartments, of which 35 would be one-bed flats and 50 two-bed – are still ‘ill-conceived’. The plans also include an 850-seat, double-height auditorium and the provision of 82 parking spaces – of which 41 would be allocated to the church and only 32 for the residents (on a permit basis), while the remaining nine would be for visitors. Residents’ objections included insufficient parking, no provision for infrastructure in what is an already congested area, and the one-day-only public exhibition had been misleading as it wasn’t to scale. Despite lack of consultation with residents, who say their comments hadn’t been taken into account, an application for the same plans was formally submitted to the council in September. THE planning meeting on Tuesday (March 5) kicks off at the Civic Offices at 7.30pm. Go to www.woking.gov.uk/planning to view the application.